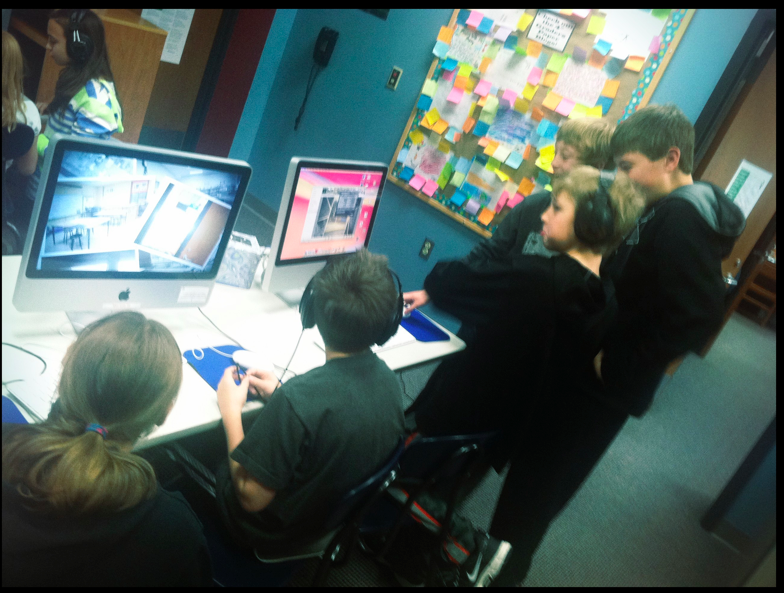 My Fifth Graders Join Club Click, Our Virtual Student Photography Club! 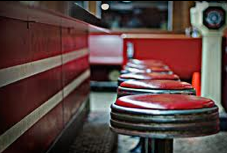 Last spring, Diane Cordell and I thought it would be fun to get others involved in "Club Click", the student photography club that the two of us started with students at Van Meter, after we had lots of interest from friends on Twitter. 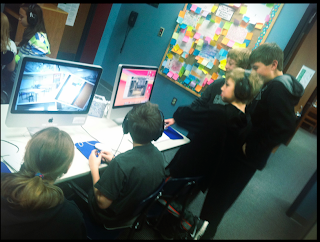 What fun to make our "virtual" photography club reach even more places, students, and teachers. After all....Diane is in upstate New York....over 1,000 miles from Van Meter so what is a few thousand more miles between all of us. 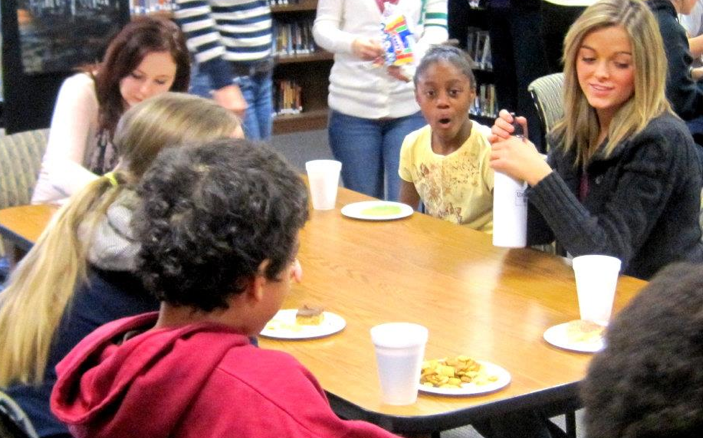 This was also the first year that I would bring Club Click to the elementary students. When John Schu and I spoke about Club Click coming to his school, we decided that our 5th graders would be a great place to start. We both introduced Club Click to our students and set off to create slideshows of our schools to share with one another through Skype. John's 5th graders at Brook Creek presented their slideshows in small groups to our students in the computer lab this fall. They were amazing! My students were so excited to create their slideshows to show them too. One of the BEST parts of this project was talking to the students about photography. Diane Skyped in with the students and talked about the photos that she takes. I showed them many examples and different devices that I used. I showed them photographs from my camera, iPhone, iTouch, and iPad. 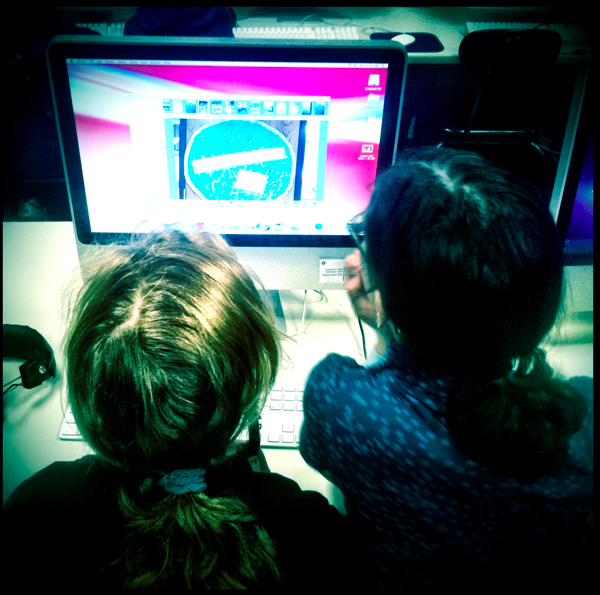 We talked about different apps that can be used and editing the photographs in iPhoto. We also discussed using images in works that they produced. I touched on copyright and fair use. 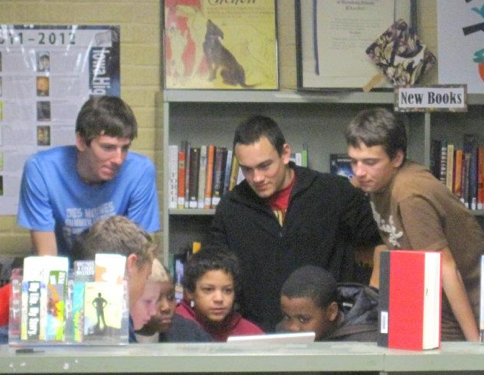 From the Little Van Meter Library Voice website, I showed the students places they could find images to use. I told the students that they could bring their own device to take photos. Some of the students brought cameras but most of them had phones and iTouches. I also have 10 iTouches and two cameras in the library that they can use anytime. They were so excited to set off in their groups to capture photographs of Van Meter to tell their story. And when they got back to the library....they couldn't wait to get started and show off the photographs they had taken. 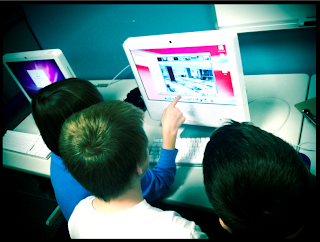 The groups worked together to choose and edit the photographs they were going to include in their iPhoto slideshows. I loved watching the groups work together too. They would ask each other to watch the slideshows and then go back into them for more editing. Some of the groups decided that they needed more photographs so would go out and take a few more. 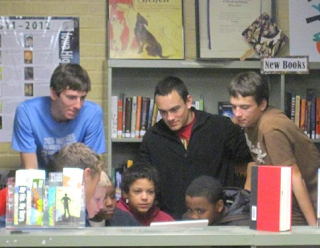 Once the slideshows were perfected, I uploaded them onto the Van Meter Librarian YouTube channel. They will be easy to share with John's students and the others who are part of Club Click. We hope you enjoy the slideshows of Van Meter, too. Two weeks ago something a little difference took place during our book club at Van Meter. 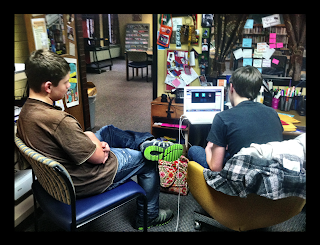 Two of my students, Collin and Paxton, sat in my office and Sebastian, another one of mine, Skyped in sick from home. But these weren't the only ones that were there to discuss Blood and Chocolate by Annette Curtis Klause that day. There were also students Skyping in from Jane Lofton's library at Mira Costa High School in Manhattan Beach, California and Joyce Valenza's library at Springfield Township High School in Philadelphia. This was the second time that the "Somewhat Virtual Book Club" met this year. 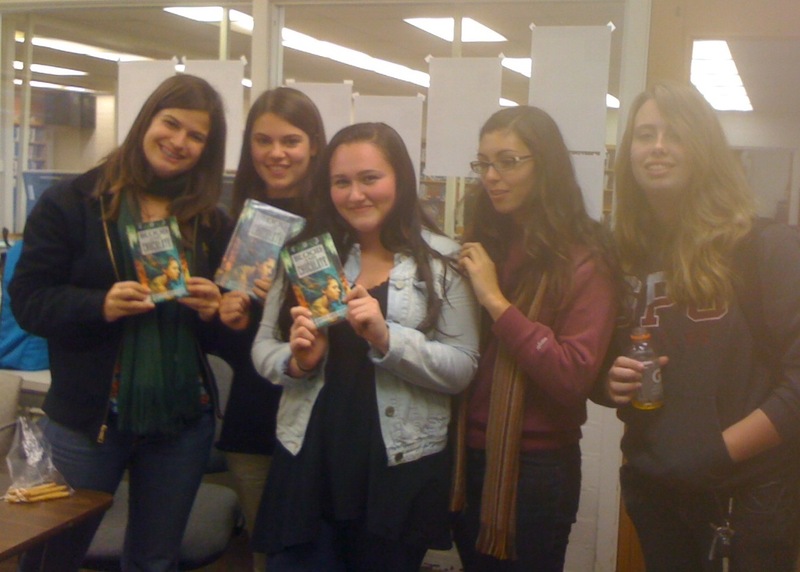 A month ago we read and discussed The Hunger Games. We have plans to pick up that conversation when the movie comes out in the spring. As I sat there and watched how much my students enjoyed the book discussion with their new friends over 1000 miles away, I smiled as I thought that this new book club started as a simple conversation between Joyce and I. I love how it now includes five teacher librarians and their amazing students around the country. 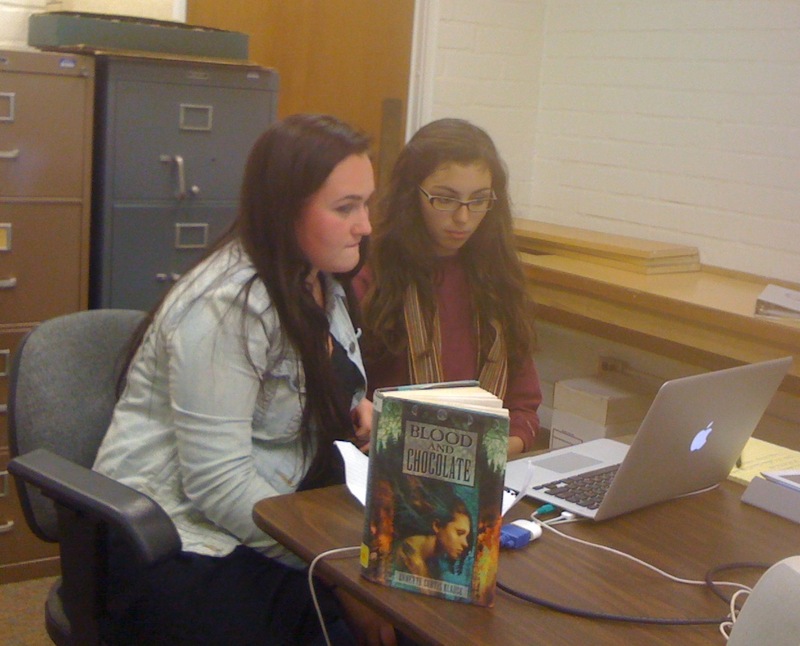 Yesterday, Jane posted on her blog Mira Costa HS Library Blog. Thank you, Jane for sharing our story and for letting me share it on the Van Meter Library VOICE too. I cannot wait to see all of you again in January when we discuss Brian Selznick's The Invention of Hugo Cabret. My group has plans to not only see the movie Hugo together but we are going to meet at the Barnes & Noble coffee shop during the next book club. 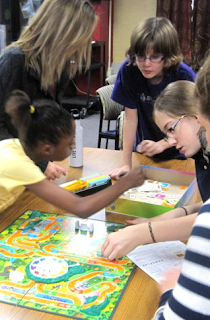 One great activity that has been occurring at the Mira Costa Library has been the growth and development of TLC: The Library Club, now in its second year. Last school year when we established the club, it was primarily a group to support library programs, and the club met every other week. I very much appreciated the help the students offered with our D.J. 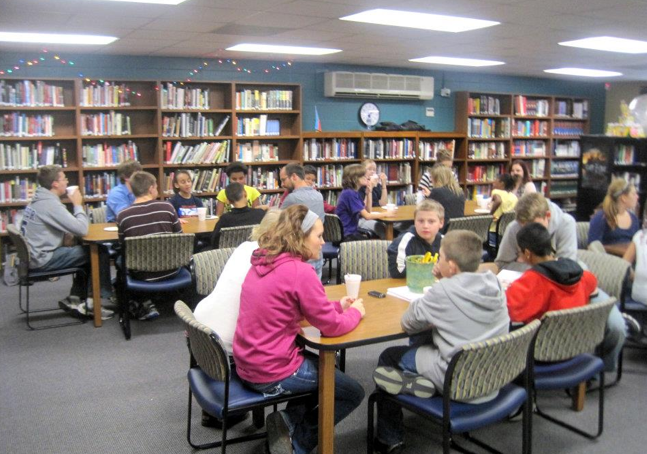 MacHale author visit, with library displays, contests, PR, and more. 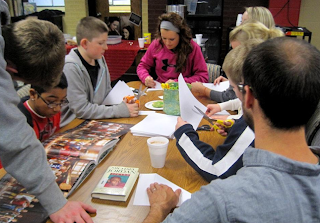 They also conducted a very successful book drive and sent the collected books to a shelter. This Fall, the students took the initiative to expand our club by meeting weekly and incorporating more discussions of books in addition to supporting the library. 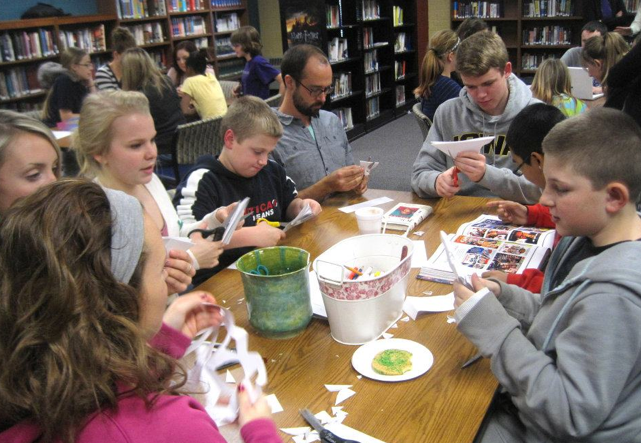 Then, in October, we had the opportunity to expand our club beyond our school when I responded to a generous open invitation from Joyce Valenza, Teacher Librarian at Springfield Township High School in Pennsylvania, to join several school library clubs in a virtual book club discussion of Suzanne Collins’ Hunger Games. Despite some technical difficulties with my computer and the challenges of time differences, our club members were able to join the group for approximately a half hour of a lively discussion of this engaging book. And, they are looking forward to “Round 2,” when we have revisit Hunger Games after the movie comes out in March. 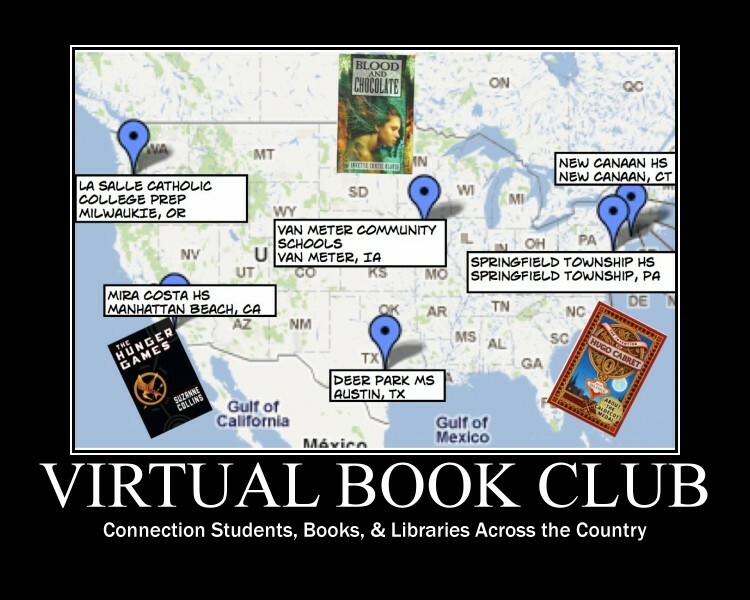 On December 1, we had our second virtual book discussion about Blood and Chocolate by Annette Curtis Klause. 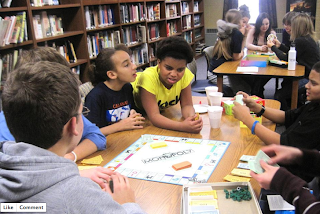 Two of the other schools – Springfield Township HS in Pennsylvania, led by Teacher Librarian Joyce Valenza, and Van Meter in Iowa, led by Shannon Miller – were able to attend this session, and one student who was ill even Skyped in from home. The students enjoyed a very lively debate about the different characters and clearly had very divergent views about how sympathetic they were. I was so impressed by their insightful comments and their ability to disagree with each other while always remaining polite and considerate. We are now reading Brian Selznick’s The Invention of Hugo Cabret and plan to compare it to the new Hugo film in January. To bring the groups together, we have been experimenting with different platforms, including Google + Hangouts and Skype. These are some of the tools that we teacher librarians have been using for webinars, virtual conferences, and professional organization meetings. Communicating across the miles in this way has also offered our students an opportunity to practice virtual meeting skills they are sure to be using in many other contexts. 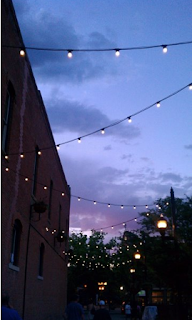 I know that I have been enjoying the opportunity to communicate across the miles – and connect and plan with talented Teacher Librarians Joyce Valenza, Shannon Miller, Michelle Luhtala, Colette Cassinelli, and Amy Lott - at least as much as our students. Something special happens when my National Honor Society students get together with their friends known as the King Dreamers. This friendship started three years ago when we went to King Elementary in Des Moines to meet an amazing group of fourth graders involved in the I Have a Dream Foundation. Through this foundation these children are given opportunities they might not have otherwise. And by developing a friendship with the Dreamers over the last three years, we have been given so many gifts from them as well. The Dreamers came to Van Meter this week for our annual holiday party. We shared food, played board games, created snowflakes to decorate the library, and had fun sharing holiday and music sites on the laptops. 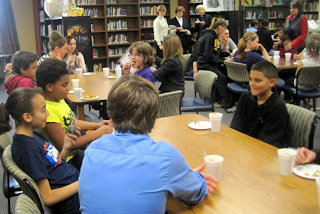 For the last part of our party, we invited the Van Meter 5th graders to the secondary library to meet the Dreamers and have a little fun with them as well. However, all of those activities were not what stood out to me and others who were observing the young people that day. As I looked around the library, I saw walls that had been taken down, friendships that picked up where they had left off, and an equality that had developed between all of them over the last three years. Laughter filled the room. Smiles were on every face. Voices were heard. 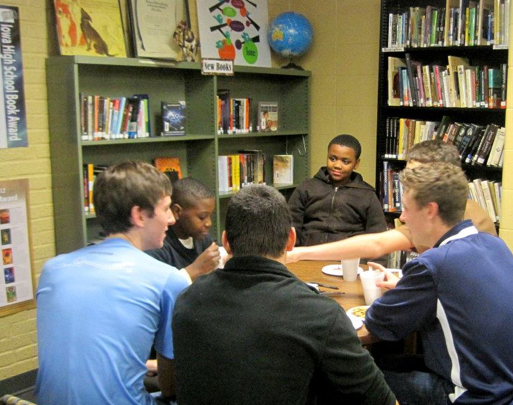 And they were all sharing a space that fostered these wonderful relationships. This to me is very important as an educator. We have given these students time to grow together and learn so many things from one another. And this is something that they none of them will ever forget. And just imagine what it would be like if every one of our young people could take part in experiences such as this. Just imagine what it would be like for us. Every day I am inspired and influenced by so many in my life. Being connected on Twitter and through other social networks, my own personal network has grown greatly over the last three years. I have been inspired, motivated, and have become a better teacher, librarian, and person because of all of you. 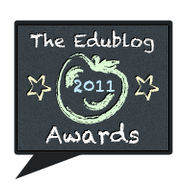 I wish I could give everyone an EduBlog award....it is not always easy to narrow down my choices for the EduBlog Awards. But these are the ones that made the greatest impact on my life this year....in more ways than one. I just want to thank all of my connections I have made. You have made a difference in not just my life, but in the lives of my students. I always love it when new teachers come to Van Meter. And our students love it too. This year we have a brand new junior high and high school science teacher. Her name is Hailey Beneke and she graduated from the University of Northern Iowa. From day one, Hailey has been motivated and excited to try new things and integrate technology into the science curriculum. A couple of weeks ago, Hailey came to me with a question about inserting PDF's into FlipSnack. FlipSnack is a Web 2.0 tool that I came across at the beginning of the school year. It lets one turn PDF documents into Flash page flip digital publications. Once your FlipSnack is created it can be shared online and even embedded into a website or blog. Hailey had her 7th graders create FlipSnack's about cells. 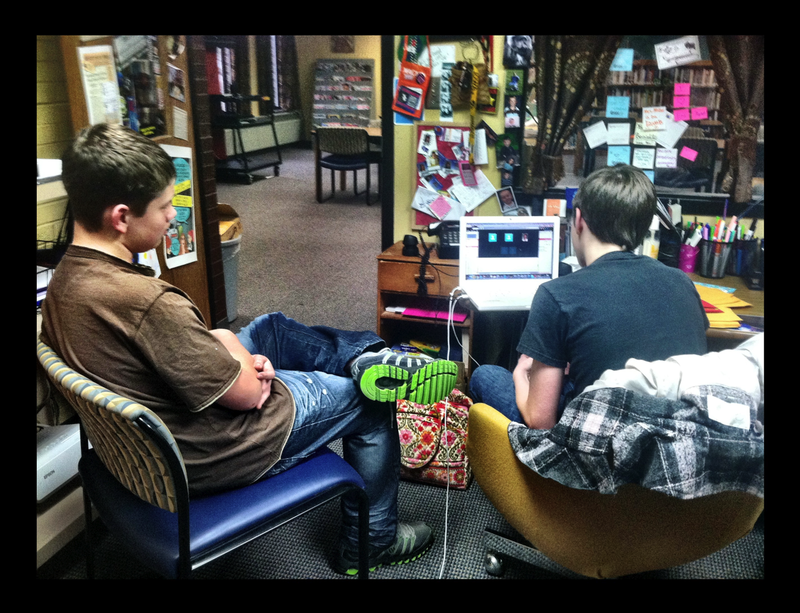 They created their pages first using Tux Paint, a free online drawing program that our students have on their MacBooks. Once their pages were created, the students took a screen shot and saved the pages as a PDF ready to use in FlipSnack. Thank you for sharing these with me, Hailey. Our students are lucky to have such an ambitious, creative new teacher. I have always been one to be inspired by the things around me. As an artist, as a teacher, as someone who hears and sees the world and all that it holds. Inspired by nature, by art work, by architecture, by churches that I sit in, by light, by music, by sadness, and by happiness. I sometimes question this....what inspires others? Does everyone take the opportunity each day to be inspired? As I started writing this post, I looked up the definition of Inspire on Dictionary.com. Inspire can mean the following...to fill with an animating or exalting influence; to produce a feeling or thought; and to animate, as an influence, feeling, or thought. Over the last few months, I have been filled more than ever with these feelings and thoughts that the definition holds. I have been influenced, moved, and inspired like never before. The reason I have been so inspired....the people that I have surrounded myself with. 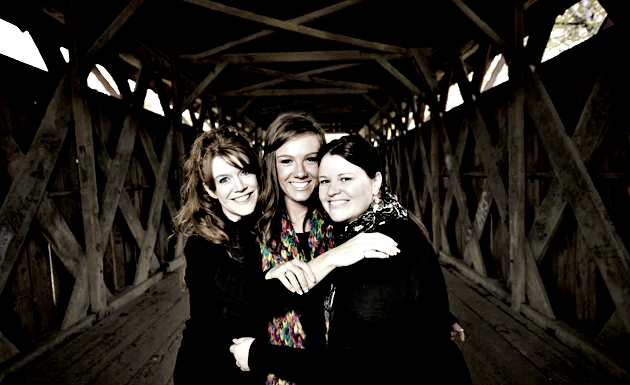 The people who have come into my life and have made a difference. It is not just the "things" that inspire me.....I am inspired by others. ....my beautiful daughter Brianna as she had her senior pictures taken in the pasture with her horse. I stood there in tears not because I was sad she was growing up, but that I held this incredible feeling of being inspired by her on that day. 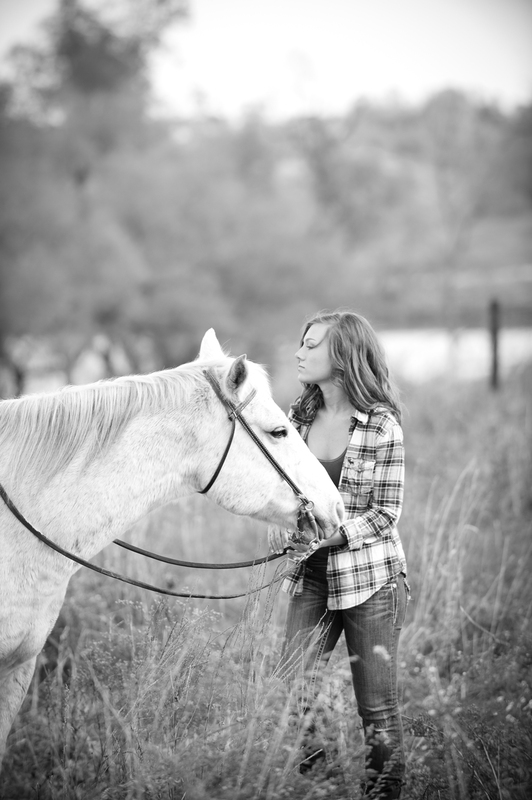 Her strength, her confidence to face the world, her happiness. I am inspired by the friendships that I have in my life. I am inspired by friends like Kristina and Brianna because they are strong, caring, intelligent, and I am never without them. I am inspired by their love. I am inspired by and so proud of my wonderful 8th graders who founded the first high school chapter of She's the First last spring. Over the last 6 months they have raised over $1,000 to put our Kisa Scholar Neema through two years of secondary school in Tanzania. Every day I watch as this group not only gets stronger together, but each individual girl gains so much of her own identity. And now, as they form a relationship with Neema, I am inspired by what they are gaining from each other and the new relationship that is unfolding. I am inspired by Neema Amos. 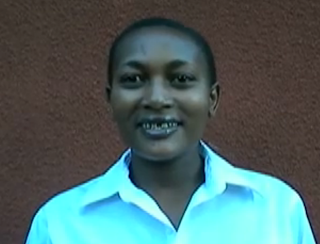 She wrote to us that she wants to go to University to become a teacher. She is so thankful, gracious, and filled with love for the girls in Van Meter that are giving her the opportunity to have the life that she dreams of. Everyone should be inspired by her. And I am inspired by the students that I am so lucky to work with everyday. Their energy, creativity, intelligence, and love for life inspires me to take it in and share it with the world. Open your eyes, listen, let it all in. Be inspired by the world around you. The little things. The big things. People. Music. Art. Words. Love. This post is from John Schu and Shannon Miller's Two Libraries One Voice blog. This week we will be celebrating "International DOT Day" together. DOT Day is on September 15th, which is when The Dot by Peter H. Reynolds was first published in 2003. On this day, Peter and FableVision Learning challenges people all over the world to "make your own mark and see where it takes you." We have been doing a lot at our schools to get ready for this super fun day. The students are welcomed into John's library at Brook Forest Elementary with this amazing display. And can learn more about Peter and FableVision here. Shannon and her students created this new display in the Van Meter Elementary Library and they are enjoying all of the new books they added to their collection too. Last week, a big group of Shannon's 7th and 8th graders created beautiful DOT art work outside. She wrote about this day on the Van Meter VOICE blog.... Today The Students Made Their Mark....On Each Other, The World, and ME! She created signs for DOT DAY on the library and art room doors. The students created signs throughout the school with the banners. And John's students started decorating paper with their DOTS too. To celebrate in the libraries this week, we have planned a lot of literacy and art activities for the students. We are going to be painting and drawing with watercolors, finger paints, crayons, colored pencils, and sidewalk chalk. There is even an activity involving coffee filters, markers, and water bottles...Oh my. Our kids are going to create DOTS using the iPads and drawing apps. We will be sharing these creations with each other over Skype. John had a great idea today.....ROLL OUT the "Read" carpet for the week and have our students add dots throughout the week. And even our students are planning things.....like Alissa. and Dot by Patricia Intriago over Skype with our students. So just as the sweet character Vashti learns in The Dot, anyone can make a mark on the world. This week in Oak Brook, Illinois and Van Meter, Iowa, we will celebrate the marks of every single person in our schools and the uniqueness of them all. We cannot wait to hear how you are going to celebrate DOT Day too! Today The Students Made Their Mark....On Each Other, The World, and ME! 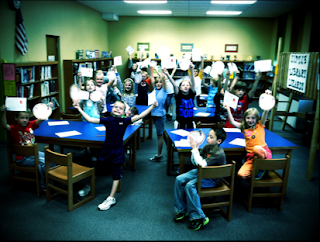 Today I read The Dot by Peter H. Reynolds to the 5th graders in the elementary library. John Schu, my teaching partner in Oak Brook, Illinois, and I are getting ready to celebrate International Dot Day on September 15th. I have been sharing The Dot with the students by reading it aloud and watching the video on BookFlix. We have had wonderful conversations about leaving your mark on the world, being unique, creative, and having a VOICE. I had been thinking about ways to decorate for Dot Day. I put up the new display in the library and taped up the Dot Day image from above, but I needed something really "WOW" in the hallways. I needed to make my mark for this event. Suddenly, I had an idea! Why was I just reading The Dot to just the elementary students? What about all of the young people upstairs? If they were to also hear The Dot, then I could have them create their own mark and help me decorate for this very special day. So when my seventh grade advisory group came in before lunch (and my She's the First chapter....and of course the several other kids that trickle into the library each day), I had them sit down on the floor as I read The Dot to all of them. We had a meaningful conversation about being ourselves, being proud of what we create, and how to make our mark on the world. They agreed! It would be very fun to create their marks and celebrate Dot Day by sharing their work in the hallways of Van Meter. We quickly gathered up paints, brushes, and bowls from the art room. I tore off really long pieces of white paper from the roll in the office. And we headed outside for a space big enough to make this happen. They took the paper and formed three groups as they painted dots. I loved seeing them work in groups that were not only different in age, but also with people they usually didn't hang out with. In this project, it didn't matter if they were working next to their best friend or the person they usually sat by in class. In this project, the only thing that mattered was they were working together to make their mark. When it was time for lunch, they carried the art work into the elementary library to dry. 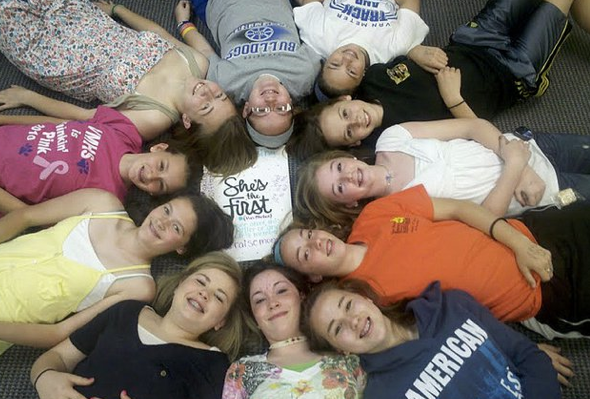 After lunch, I had a group of girls in 7th and 8th grade come back to find me. I had told them we needed to really make our mark on the library doors and art room. They decided to create huge, beautiful dots which turned out to be unbelievable pieces of art work. Twelve girls worked together to create these dots that will hang on the doors tomorrow celebrating Dot Day. Together with the amazing banners, I cannot think of a better way to celebrate not only Dot Day, but the uniqueness, creativity, and VOICE of our students at Van Meter. This is not what I had planned to do today. I didn't have it on my Google Calendar. I didn't gather the supplies beforehand. But you know what, this was one of those days that aren't planned, that aren't laid out step by step. It was one of those moments that happens to every teacher. Those moments that we take just as much, if not more, from our students and learn a valuable lesson from what is happening around us. It was so much fun for me to stand back and see this happen today. Within 25 minutes, a group of kids who met in the library everyday from 11:30 to 11:55am opened up, worked together and created something that they were proud of. They made their mark. Not just on the paper or in Van Meter. But on each other. And most of all, on the world. I hope you join all of us to celebrate Dot Day and make your mark too!